The new 'men behaving badly' comedy flick from writer/director/producer Todd Phillips (the man who also brought us 'OLD SCHOOL','ROAD TRIP', 'DUE DATE' and all three 'HANGOVER' movies). 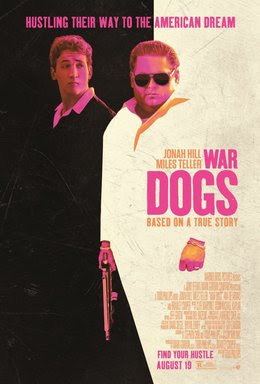 The film is based on a Rolling Stone article, by Guy Lawson, about two twenty-something arms dealers, that land a U.S. contract to supply weapons to Afghanistan military forces. Phillips directed, co-produced and co-wrote the movie; with Stephen Chin and Jason Smilovic. It stars Miles Teller, Jonah Hill, Ana de Armas, Kevin Pollak and Bradley Cooper (who also co-produced the flick). The movie's received mixed reviews from critics, and it's done mildly well at the Box Office. I liked it, but it's definitely no 'HANGOVER' (it is far better than it's two sequels though). David Packouz (Teller) was working (unhappily) as a massage therapist, in Miami Beach during the Iraq War. His girlfriend Iz (Armas) unexpectedly became pregnant, and David decided he desperately needed a new source of income. So when he runs into his old childhood friend, Efraim Diveroli (Hill), at another old friend's funeral, he learns he can make a lot of money selling guns to the U.S. military (like Efraim already is). The two form a partnership, and get rich (really fast), but they also run into some serious problems. The movie is only loosely based on true events; a lot of it is entirely made up (which makes for a more entertaining film, of course). It's nice to see Phillips branching out as a filmmaker (and I really wasn't impressed with the two 'HANGOVER' sequels), and it's also cool to see Hill playing somewhat of a villain. Teller is perfectly cast as the relatable lead, but he's capable of much more than this though ('WHIPLASH' is one of the greatest movies ever made, in my opinion). This film is fun (at times), and kind of interesting. It's a little too dark, to be a lot of fun though, and a little too light, to be really interesting (in a very serious way, anyway). The performances are good though.